I completed a 50 mile ride today and the distance wasn’t the hardest part. It was the hills. It was my most challenging ride to date as a new rider, but I survived and I finished. Since getting my bike at the end of March, I’ve steadily increased the number of miles I can complete in a single ride. Earlier in the month, I hit 40 miles, so I decided to stretch myself again and signed up for the 50 mile ride as part of the 2015 Sweet Corn Challenge in Richfield, Ohio?. Silly me, I totally undervalued the words “more challenging” to mean the 50 mile ride would have some nice rolling hills to break up the monotony of a flat ride. Little did I know that it would challenge me more than any other ride to date. 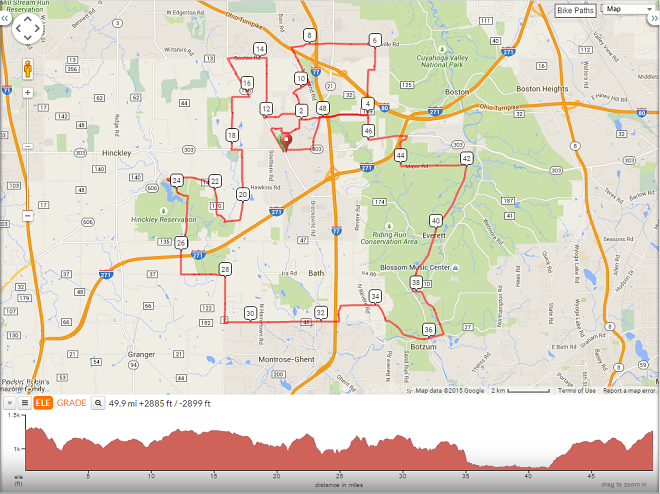 According to my Strava stats for the ride, the elevation change for the ride was 2,890 feet. That’s like riding up the side of the 52-floor Terminal Tower in Cleveland 4 times. It was pushing myself and my hybrid bike, a Trek FX 7.2, up those hills that I really learned how far I can push myself. They were threatening, demanding, even grueling, but somehow I managed to make it to the top, then onto the next hill to challenge. All told, I burned an estimated 2,200 calories during the 4 or so hours spent on the road. Wow. I really can’t believe I finished it. So … who’s up for the next big ride of the Summer?